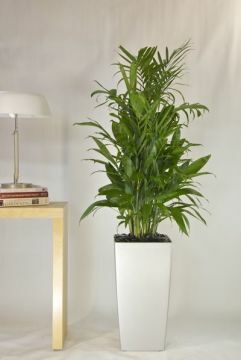 The beautiful compact Bamboo Palm, native to Mexico and Central America, is perfect for low light areas. 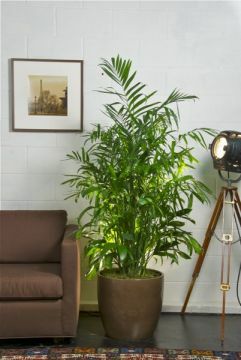 Indoors, a Bamboo or Reed Palm, can reach a height of 5-7ft. and a width of 3-5ft. with multiple reed-like stems growing in clumps. There are about 10-15 fronds on each stem of a Bamboo Palm and each frond has 10-14 pinnate (feathery) dark green leaflets. The base of each stem of a Bamboo Palm is covered in a tan colored fiber that resembles bamboo. The graceful Bamboo Palm is much hardier than an Areca Palm and much less expensive than a Kentia Palm. NASA lists a Bamboo Palm as a clean air plant. 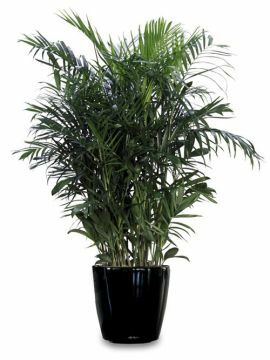 LIGHTING REQUIREMENTS: Although a Bamboo Palm grows faster in bright indirect light, it will do well in medium light and even low light if you're careful not to over-water. CARE INSTRUCTIONS WATER: Always allow the top 1/3 of the soil of a Bamboo Palm to dry out before watering. Never allow a Bamboo Palm to sit in water. Do not use water that has passed through a softener on a Bamboo Palm because it has a high salt content and it will damage the leaves of a Bamboo Palm. Leaf tips turn pale and green leaves fall off of a Bamboo Palm because of over-watering. New growth and leaf tips on a Bamboo Palm turn brown from under-watering. FERTILIZER: Feed a Bamboo Palm monthly in the spring and summer with a fertilizer high in nitrogen at 1/2 the recommended strength. Don't use plant food if a Bamboo Palm is not actively growing or if the soil is very dry. TEMPERATURE: A Bamboo Palm does well in temperatures between 65-80 degrees. HUMIDITY: All palms, including the Bamboo Palms, like high humidity. PESTS: Bamboo Palms are very susceptible to spider mites, scale, and Mealy Bugs. Keep a Bamboo Palm clean by spraying it often with a mixture of biodegradable liquid soap and water. If the pests persist, spray the plant with an insecticidal soap. SOIL: Bamboo Palms need a basic well-aerated potting soil that drains quickly but still retains water.